The combination of powerful software capabilities integrated with compact, rugged, all-in-one smart camera solutions enables new capabilities and increased value for industrial automation and robotic vision guidance applications. ADLINK Technology, Inc., a global provider of advanced Edge Computing products will showcase the latest smart cameras, embedded vision systems and expandable computing platforms for graphic-intensive vision applications at AIA’s vision show, April 10-12, at the Hynes Convention Center in Boston, Massachusetts in Booth #528. NEON smart cameras that combine a PC, a frame grabber, an I/O extension board, and a camera in a single housing. 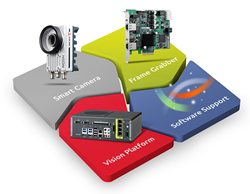 The NEON smart camera is an open x86 based platform and supports many industry leading vision software applications. Matrix and MVP series industrial PCs with high-performance computing combined with PCI/PCIe high-speed expansion slots in compact enclosures. Full line of PCI frame grabbers including, PoE GigE, HDMI, Camera Link, and CoaxPress. Also on display in the ADLINK booth will be a live robotic vision demo with partner Recognition Robotics. The Robeye 3D vision guided robotic (VGR) solution demonstrates the NEON all-in-one smart camera integrated with an industrial robot arm for robot guidance. ADLINK vision solutions will also be on display at the Robot Vision Technologies booth (#907). RVT will be showing off the latest version of its award winning collaborative Vision Factory (cVF) software platform, a highly advanced system allowing machines to more precisely operate in their environments. For more information on ADLINK’s vision solution, please visit our website at http://www.adlinktech.com.